I’ve been living in Ireland for 3 years, there are around 120,000 Polish people in Ireland, that means Poles are basically everywhere. On every corner (almost) you can find Polish shop, so I’ve never missed Polish food. But from what I know Polish food is still treated as exotic and not well-known. I would love to change it and see more Irish people discover Polish products. So I will try to help you getting familiar with Polish products. I know it’s not fair to tempt you with chocolate and sugar, but so far I see it as the best bait, so please forgive me. But let’s start with basics. I get it, Polish shop can be scary. Very often they are not even called Polish Shop, they are called Polski Sklep, it’s not to scare you off, it’s too make it more Polish. I know at first you may feel overwhelmed, there are so many different brands and products you don’t recognize, but that’s actually the reason why I want you to go there, because you can find real treasures, things you don’t get anywhere else. Because we Poles love a variety, we don’t settle for one type of product, we need to have at least five different ones. Don’t be scared you won’t know what things are – all Polish products should have a little label in English with a product name and ingredients list. When you go to Polish shop for the first time you don’t need to buy anything, just walk around and get familiar, or you may buy something that you find familiar – a bag of crisps, cookies, ketchup,etc. Or try one of the chocolates I introduce today. Polish chocolates, I mean individually wrapped chocolates like Cadbury Roses, we will talk about chocolate bars another time. I asked two friends to help me and share their thoughts on Polish sweets, as I wouldn’t be objective, for me they are what they are. They bring memories of birthdays parties, aunts and uncles visiting, but they are familiar. Tiki taki and Kasztanki are pralines made by company called Wawel for 40 years, there is actually a third chocolate in this family called Malaga, but I don’t like it. Amielia doesn’t like it, neither Tomek, so there is no point in talking about it. They have silly ad for them, but are really good, classic chocolates. They are such a pretty shape (something i have really noticed about Polish chocolates – they are pretty!). The chocolate layer is perfectly thin then there is an amazing nut layer then a coconut layer! The three best flavours in the world in a perfect little parcel! Reminds me of macaroon bars we had in Ireland as kids except way nicer. They were just called Macaroon. They were affordable for children back in the old days. You could buy for 10p They were just a solid block though without the creamy goodness. 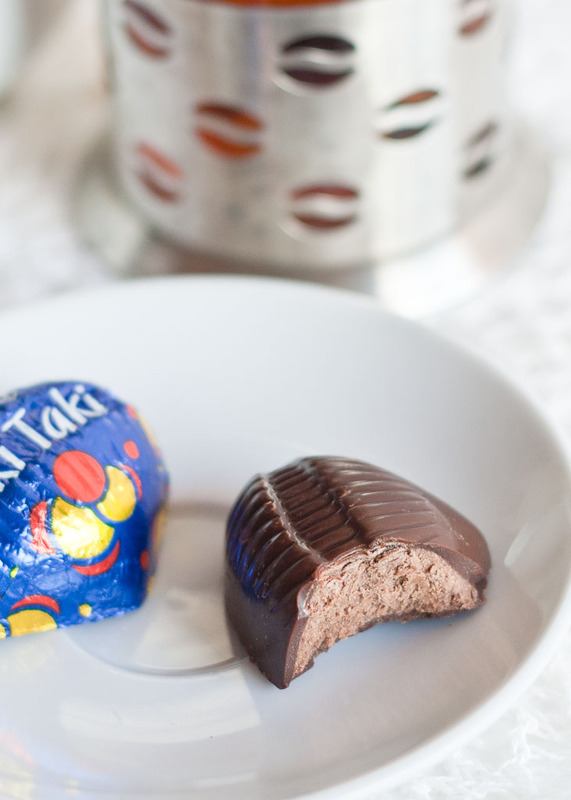 Kasztanki have a crushed wafer and cocoa filling and are covered in dessert chocolate. They are quite traditional, but if you like a little bit crunchy, you may like it. The best thing about many Polish sweets it that you can buy by weight, so you can buy as little as two or three and you can pick and mix them easily. Both Kasztanki and Tiki Taki come either in a big box 420g or buy them by weight (around 15 euro per kilo). Michałki are another classic Polish chocolates known for over 40 years, they have cocoa filling with chopped peanuts and are covered with dark chocolate. Currently, they come in a few additional varieties – white ones (Białe) covered in white chocolate, coffee (kawowe) and coconut (kokosowe). Garrett said even though they tasted familiar, but was difficult to place. I think a reason for that is they are harder and drier than other Irish chocolates. Michałki come either in a bag (280g), in a box (500g), or you can buy them by weight (around 12 euro per kilo). It is what it sounds like – a cherry, liqueur, and chocolate. In final ranking, Garrett gave them the highest mark. I don’t know what can I tell you more, just try it. Cherries come either in a 280g or 400g box or you can buy them by weight (around 15 euro per kilo). Ptasie Mleczko is a real classic, it was invented almost 80 years ago. Literally, it translates as bird’s milk, something very rare and delicious. It’s elegant, but not very fancy. It’s a light vanilla foam covered in milk chocolate, it’s light like a cloud and you can eat far too much. They are definitely my favorite ones. Garrett described it as a bite-sized chock-ice. They are now amongst my favourite strange Polish sweets! I don’t know what category they fall into really – i guess a sweet…i love the white chocolate ones and the coconut ones. You can get Ptasie Mleczko in big boxes (420g / around 5 euro) or in a small one (56g). The traditional flavor is vanilla, but there are different flavors of lemon, chocolate, cream, and coconut. Thank you, Garrett and Amielia for helping me out with this post. PS. If you ever wondered how to pronounce Polish words here is a tool that will help you – Ivona. Would you like to know anything in particular about Polish products? Posted in Life, Polish food and tagged chocolates, Polish products. Bookmark the permalink. Ty chyba masz jakies polskie sklepy w okolicy? There is a Polish shop near me and I am there often. Although I don’t speak Polish I can pretty much understand what everything is if I put my knowledge of Russian and Ukrainian together. My husband, on the other hand, is quite possibly the only non-Slavic person who frequents the shop and they still don’t get it why he is there! He loves Slavic food so much! 😉 I love the Polish food series! Ha ha. Apparently there are a lot of Irish people appreciating Polish food, but I try to advertise it more. What is your favourite Polish food? And what about your husband, what does he like? I once had some Polish Cherry liqueur that was bought for me in London. Think the label said “Karafka – Nalewka Wisniowa”. Is this a well known product? Any suggestions as to where in Ireland I might find a bottle, or something at least very similar? I would check Polish shops first. If I see it somewhere I will let you know. Agh! My autocorrect changed Magda to “amanda”. Sorry!! Nice blog, good info and great design. One thing that repels me though are the photos of half eaten chocolates. You could have cut them with knife if you want to show what’s inside instead showing them half bitten with your teeth marks on. Gross and disgusting!